Breetish Mandate o Palestine, in daurk green, as defined bi the Franco-Breetish bundary greement (1920) an the Transjordan memorandum (1922), mappit ower the borders o the day's Israel, Wast Bank an Gaza Strip. 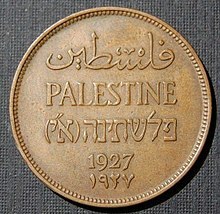 Palestine; Arabic: فلسطين‎ Filasṭīn, Falasṭīn, Filisṭīn) is a conventional name uised, amang others, tae describe a geographic region atween the Mediterranean Sea an the Jordan River, an various adjoinin lands. The name "Palestine" is the cognate o an ancient wird meanin "Philistines" or "Land o the Philistines". In keepin wi the Greek cultur o the day, it haes an aa been suggestit that it mey an aa be a play on the wird Παλαιστής Palaistes (Greek for wrestler) an a reference tae Jacob, later cawed Israel, the foonder o the ancient Israeli naition. The earliest kent mention is thought tae be in Ancient Egyptian texts o the temple at Medinet Habu which record a fowk cawed the P-r-s-t (conventionally Peleset) amang the Sea Peoples who invadit Egypt in Ramesses III's reign. The Ebreu name Peleshet (פלשת Pəléshseth)- uisually translatit as Philistia in Inglis, is uised in the Bible tae denote the soothren coastal region that wis inhabitit bi the Philistines tae the wast o the ancient Kinrick o Judah. ↑ "The Palestine Exploration Fund". The Palestine Exploration Fund. Retrieved 2008-04-04. ↑ Sharon 1988, p. 4. ↑ Room, 1997, p. 285. ↑ Greek Παλαιστινη from Φυλιστινος/Φυλιστιειμ, see e.g. Josephus, Antiquities I.136; cf. First Book of Moses (Genesis) X.13. ↑ "JSTOR: Bulletin of the American Schools of Oriental Research, No. 313 (Feb., 1999), pp. 65-74". jstor.org. Retrieved 17 July 2010. ↑ Fahlbusch et al. 2005, p. 185. ↑ Lewis, 1993, p. 153. Wikimedia Commons haes media relatit tae Palestine. This page wis last eeditit on 7 September 2017, at 11:36.